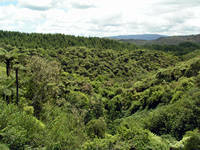 People who like eco-touring, or seeing Nature at its most primeval, may want to make a note of the Waimangu Volcanic Valley. 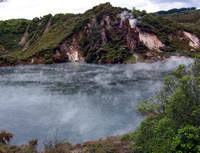 It is a geothermal area in New Zealand, just south of Rotorua in the North Island, and was formed only 118 years ago by a massive volcanic eruption that destroyed a mountain called Tarawera. The exploding Mt Tarawera smothered a nearby settlement, Te Wairoa, now known as The Buried Village and formed the volcanic valley at Waimangu. There are seven thermal craters within the valley that is something out of the age of dinosaurs. Fern-covered hills are dotted with steaming fissures, the waters of the small lakes are shrouded in hot mists and a hot-water stream bubbles through pristine bushland. It doesn't take much imagination to look at the scenery and picture a tyrannosaur or spinosaurus lurking somewhere within the treeline just waiting for you to venture too close. Walking along the paths at Waimangu is a very peaceful thing to do with plenty of native wildlife and flora to look at along the way. The visitors' centre will arm you with a map and that gives you more than 30 things to stop and look at in the valley. There are three walks you can take, all interconnected, and they run from one hour (1.5 kilometres) to two hours (3.6 kilometres). They take you past the Southern Crater, a 50-metre deep water-filled crater that was born during the 1886 eruption, Echo Crater and the world's largest hot spring Frying Pan Lake. Echo Crater is an audiophile's dream come true with lots of weird and wonderful sounds using from the springs and vents in the vicinity. The 55-degree Celcius water in Frying Pan Lake is acidic and covers 38,000 square metres - sort of like a hot bath and skin remover all in one. 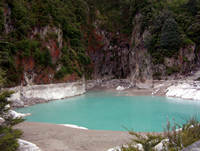 Not far from those attractions is arguably the highlight of a visit to Waimangu - the stunning coloured waters of Inferno Crater. You need to take a steep-stepped detour from the main track (it says two minutes but it is less than half of that) and the sight is worth any amount of huffing and puffing. The water of Inferno Crater is an amazing turquoise hue and, considering it was created when the eruption blew a hole in the side of Mt Hazard, it is incredibly peaceful. This belies what is going on under the surface of the water because Inferno Crater is actually the world's largest geyser-like phenomenon although its geothermal activity is hidden some 30 metres down. Bus Stop No.1 is only a few minutes walk further on and that can take you back to the visitors' centre if you are pressed for time. Just ahead is an interesting placed marked as Buried Soil and this cliff area clearly shows the black band of soil marking the erupting Mt Tarawera and a 2000-year-old pumice layer underneath it. Waimangu also boasts some beautiful silica terraces and stalactites and hot springs that allow unusual lichens and mosses to grow. The end of the walk is at a picnic area on the shores of Lake Rotomahana and there is a 45-minute cruise available for those wanting to get a water-side view of this volcanic area. A note there is no toilet on board the vessel. Then it is take the bus back to the visitors' centre for a pie and soft drink, or coffee, and look out over a valley containing some truly beautiful scenery.